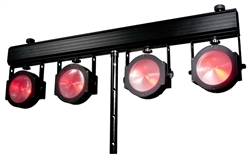 The Dotz TPar System (up to 10ft high) is an exciting all-in-one LED Wash system for mobile entertainers bands and stage lighting. 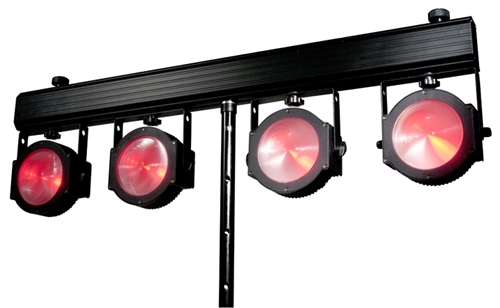 This lighting system features a 4-head T-Bar light system each with one 30-Watt COB TRI LED (RGB), producing wide, saturated color washes of light with LEDs rated at an extremely long life of 50,000 hours. The system washes a very large area with its 90-degree beam angle. Or change the light output to a 25-degree beam with the included lens kit.